The air is just turning crisp here in Seattle. It reminds me of home, of Massachusetts, where the trees are so technicolor orange against the bright blue, sunny, clear sky that it could make you cry from the sheer beauty of it all. Today was the quintessential day for making soup. When L. walked in the door after work as the soup was simmering he said "Oh, yeah. It smells amazing in here. Wow." And that first bite? "This is good. This is very very good." Sometimes it just makes me so happy to make him happy. We blended the potato/ leek/ chicken broth mixture in small batches in the food processor but we left plenty of texture so the soup felt hearty. 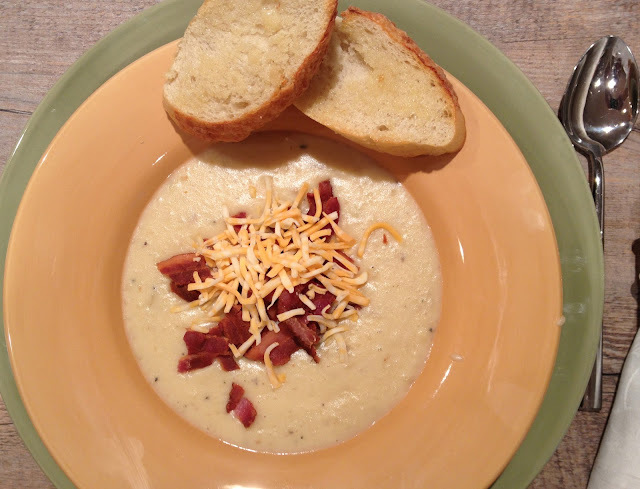 Before serving, we added crisp bacon and shredded cheddar cheese on top of the soup. Toasted Asiago bread was the perfect accompaniment.